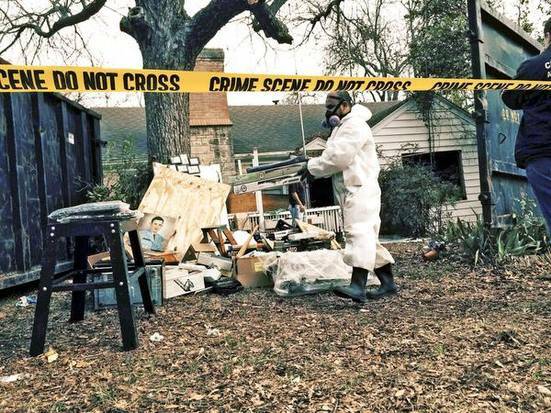 Skip Bynum was a Texas man who died in his hoard in March 2014. His neighbors had their suspicions that he was a hoarder for quite some time — it was hard to miss the fact that the only thing to see when looking into his windows was a ceiling-tall pile of random junk. The outside of the house was kept up okay (minus some complaints about weeds that he’d dealt with in a timely manner), and he wasn’t bothering anybody so no one thought there was a reason to intervene. Though the neighbors didn’t know a whole lot about him, their general consensus was that he seemed like a nice guy. He had a variety of eclectic interests that kept him busy, including a love for model trains and a fascination with ham radio. He didn’t leave the house a lot but he wasn’t a recluse either, regularly attending meetings with other model train enthusiasts as well as going to regular church services and visiting his friends. Those friends reported him missing to authorities in mid-March. They hadn’t seen or heard from him in awhile and they knew that he’d been feeling ill. Rescue workers pushed their way into the home past piles and piles of things. The 1372 square foot house was completely cluttered with debris. They couldn’t even get into some rooms through the doors; they had to cut holes in the roof to get in through the attic. Authorities looked around the house as much as they could that first day, but there was no sign of Bynum. Even rescue dogs were no help finding him in the home. It wasn’t until five days later that the man’s dead body was found amongst his things. His little Chihuahua, a dog that none of the neighbors even knew he had, was found alive after several days of cleaning. Bynum was an only child with no surviving family members. He’d drafted a will many years ago but never signed it, so the big question after his death was what should happen to his overflowing estate. That’s a lot of stuff that needs a responsible owner.